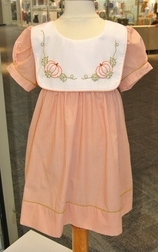 We just love Sweet Dreams' designs and this pretty little dress is no exception! 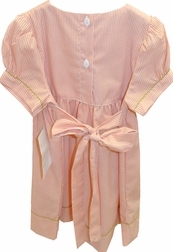 The dress is made with a small orange stripe fabric and trimmed with lime ric rac on the skirt and lime stitching on the sleeves. 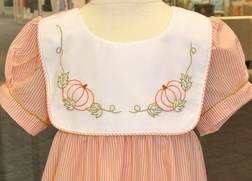 It has a square collar with two gorgeous shadow embroidered pumpkins, leaves and vines. 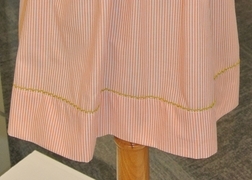 The collar is piped in the orange stripe fabric.